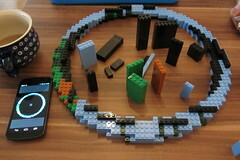 Here I will introduce you to my LEGO project. A long time ago I came up with the idea to set up a globe in my apartment. To have a little earth in the living room is a beautiful sight. 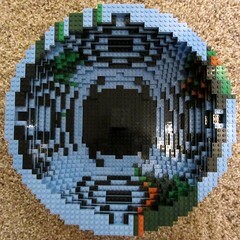 To build the whole thing from LEGO appeared to me as a challenge and made it even more interesting for me! australia and those lovely islands..
the highest mountains on earth..
where is that banana from? say hello to dr. killroy! 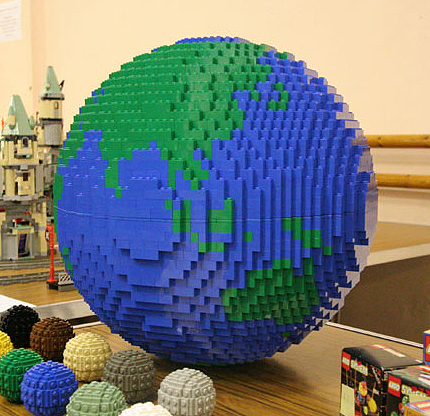 The globe including stand consists of 3863 bricks. 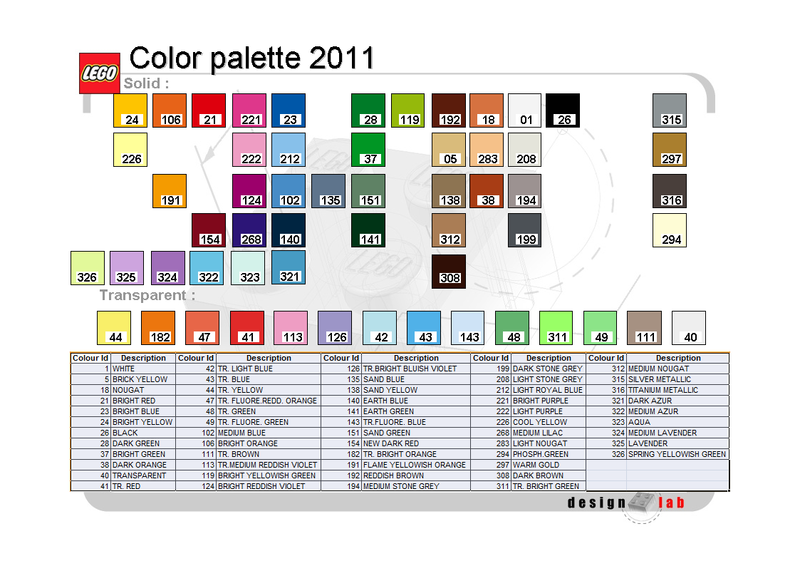 There are 40 white, 187 dark orange, 343 green, 367 dark green, 379 reddish brown, 794 black and 1753 medium blue ones. 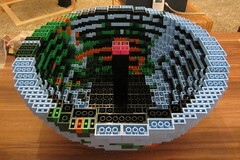 The diameter is 48 studs or 38,4 cm. 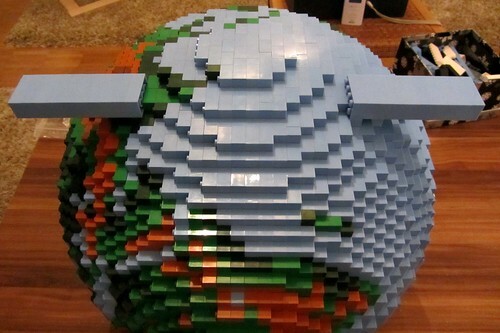 The globe is assembled from 40 layers of LEGO (38,4 cm high). 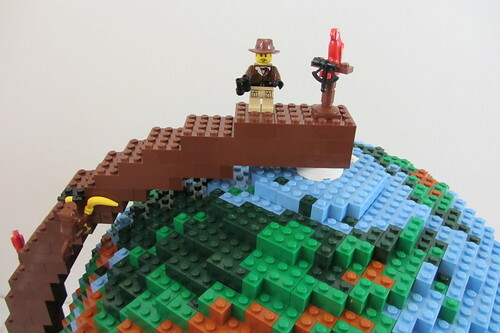 Overall, the globe with stand is 50 cm high. It has a weight of 7,3 kg (thereof 6,2 kg for the sphere). The planning took me countless evenings/nights - the building took another 4 evenings ;). 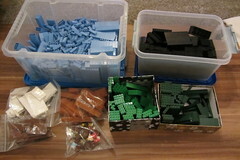 To get all the bricks required, I posted 23 individual orders on Bricklink. I won�t tell you about the total costs � my wife could read this ;). 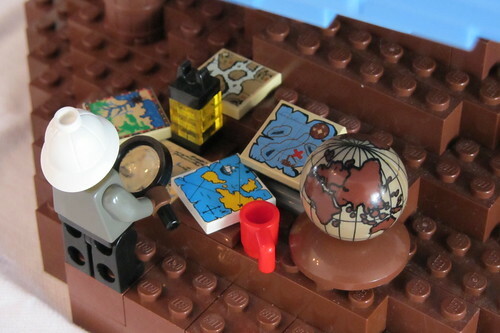 Before I started to build my own LEGO globe, I wanted to know, what already existed in this section. 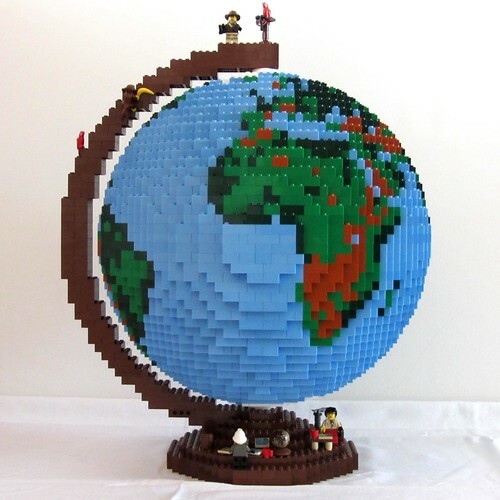 I found a lot of LEGO globe projects and interesting facts around the internet. 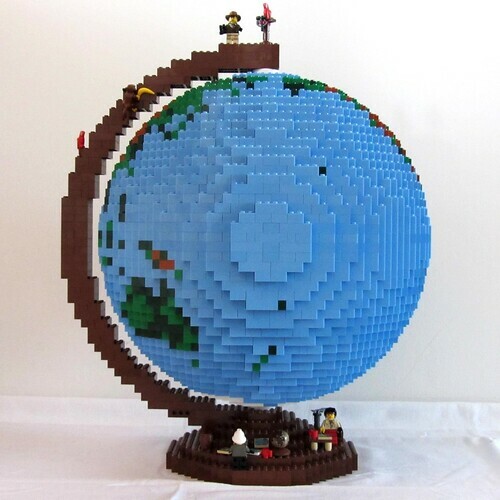 After a little googling I found Nathan Sawaja's globe. This was already very pretty, but unfortunately not very accurate regarding the height indication colors and the demarcation of land and water. For example Middle America or the northern parts of Canada and Russia are not very exact in comparison to the land surface or the height indication of the �real� earth.. 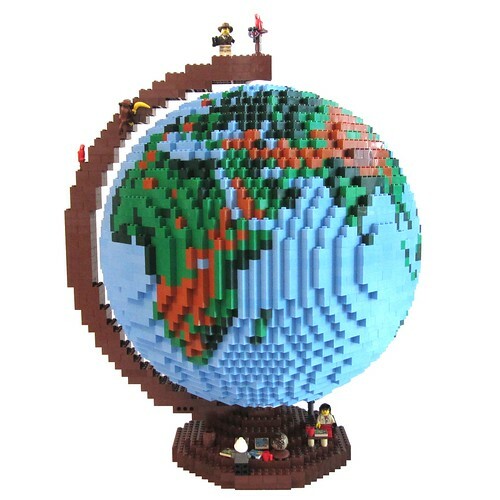 So I began to build my own globe with LEGO Digital Designer ;). The toughest part during the planning of the globe was to depict the land areas as precisely as possible. 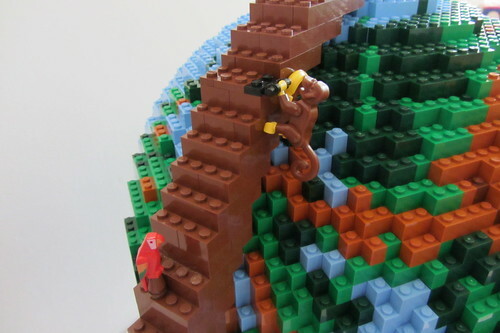 I wanted to use only "standard" LEGO bricks, so no plates, slopes or similar bricks were used. They would have increased the accuracy just a little bit, but not significantly. 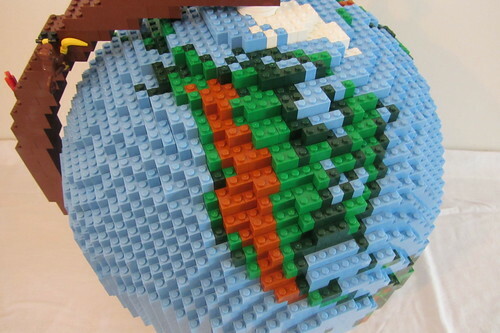 Furthermore shows a model, which is only made from standard LEGO bricks, the modelmaking character of LEGO and its fascination better than one with extra bricks in my eyes. 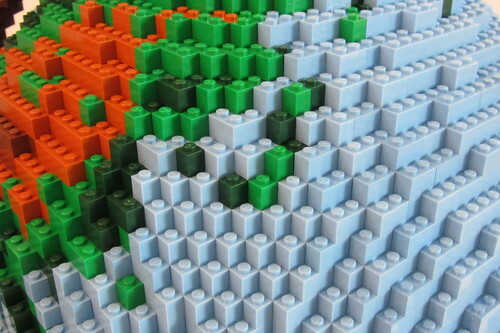 After I took a look at the LEGO color palette, I decided to choose 4 colors for the different land contour lines (dark green, green, dark orange and reddish brown), white for permafrost areas and medium blue for water. 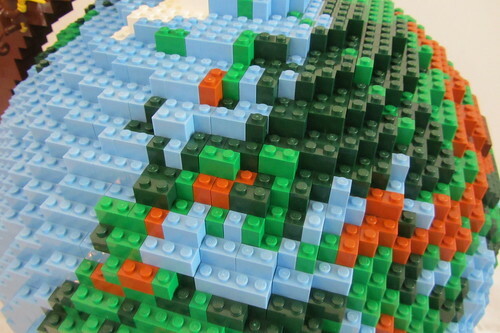 The normal LEGO blue would have distinguished too little from the dark green of the land areas and the contrast between land and water would have been too unclear. Here is an example with normal blue for the water. Therefore the choice fell to medium blue for the water. For the stand I decided to pick a nice wood tone I also would have chosen for a real globe. After the color choice was fixed, I had to think about setting the boundaries of land and water. After several attempts with satellite images of the earth and long deliberation I took the great open-source program marble to help me out with this purpose. 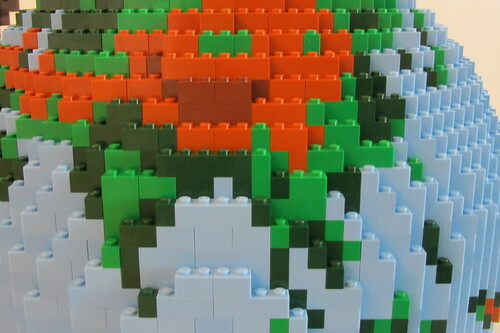 I adjusted the colouring of the contour lines in marble exactly as they would appear on my digital LEGO globe to make them as comparable as possible � thanks to open source software you have all the freedom to do whatever you want to a piece of software ;). 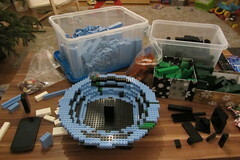 Then I began to adapt the outside of the globe in LEGO Digital Designer brick by brick to the marble version. The whole process lasted weeks, because I only worked on it in the evenings/nights. I really wanted it to be as precise as possible! 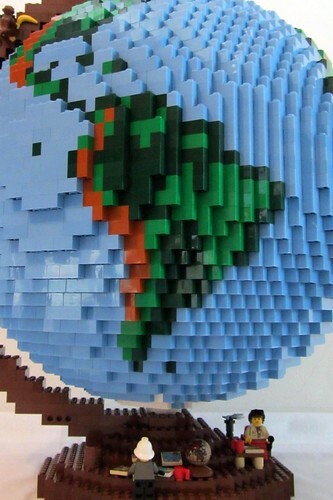 After I had finally decided on each "pixel" of the exterior of the globe, I started to combine identically colored bricks into larger ones. 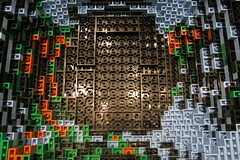 The problem here was that certain bricks from LEGO Digital Designer aren�t available for sale or exist only in very small numbers on BrickLink. These are for example "dark green 2x2 corner", "medium blue 1x3, 1x6 and 2x6" or "reddish brown 2x8". 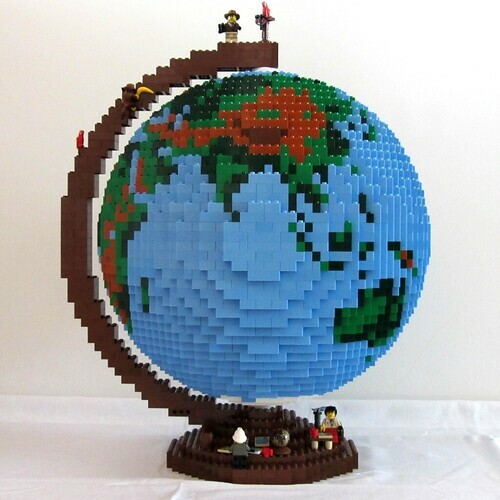 I noticed that not till I started to buy LEGO on BrickLink.. ;) So I had to replan the globe once again. At the same time I wanted to build an inner structure for stability. 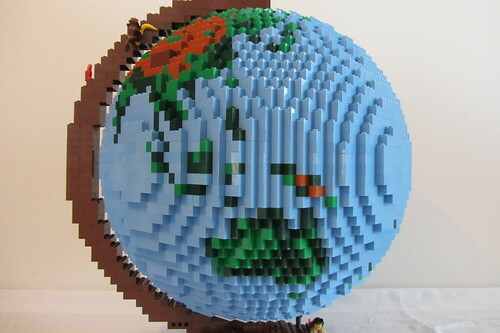 After several considerations I decided to build the globe at least 4 tiles wide because many other globe projects online were facing stability problems. The bricks that were not to be seen from the outside should be black. 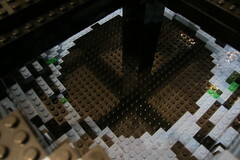 In this way the construction was easier and I spared my budget - black stones are very cheap at BrickLink ;). 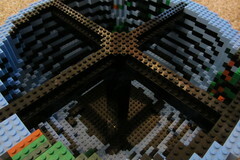 To increase the stability I decided to build a cross in the middle of the globe. Afterwards this came out as a very good idea � without the middle cross I could squeeze the globe more than one centimeter. The first and the last six layers made some trouble during construction. Although I planned my globe to be steady, I had to add two more layers of bigger black bricks to make it �perfectly steady�. 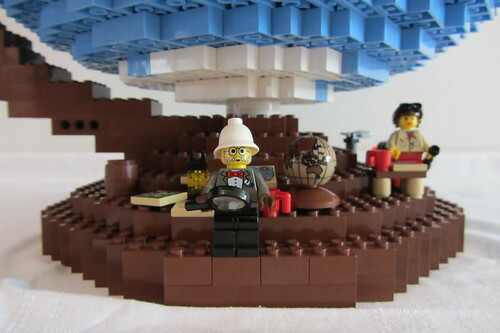 Two new orders from Bricklink solved the issue and I ended up with eight �fully filled� layers per spherical half. 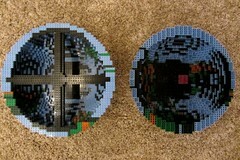 Now the only thing missing was a worthy stand, the mini-earth can rotate in. I chose a flat stand. The axial tilt of the globe should have been exactly the axial tilt of the earth and match precisely 23.4�. 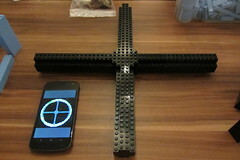 I achieved this with some simple LEGO technic bricks (within the ring and on the stand � connected with two pins) with the exactness of a tenth of a degree � at least in theory.. I realized very early, that I had to glue the retaining ring together with superglue to one part. Otherwise the globe would have simply fallen off the stand because of its own weight. This is the only use of glue in this project. 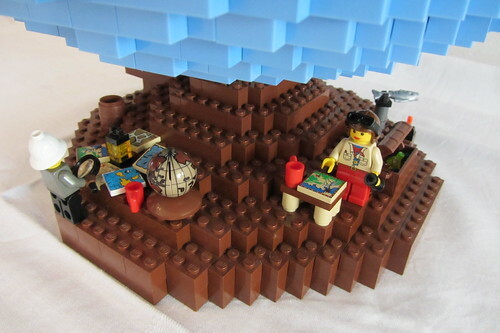 You can find a very nice guide with tips and tricks for gluing LEGO here. After gluing the stand I wanted to fit everything together. 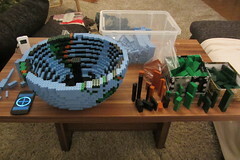 The only problem was that the globe fell off the ring every time I wanted to assemble it. The globe was just too heavy to remain within the stand.. The only solution would have been to glue the globe to the stand, but I didn�t want the earth to be glued too, so I finally decided to place it upright in the stand. 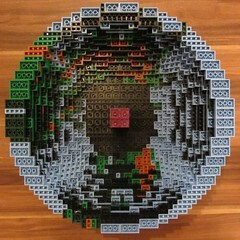 The globe can be rotated by two round white 4x4 LEGO turntables. 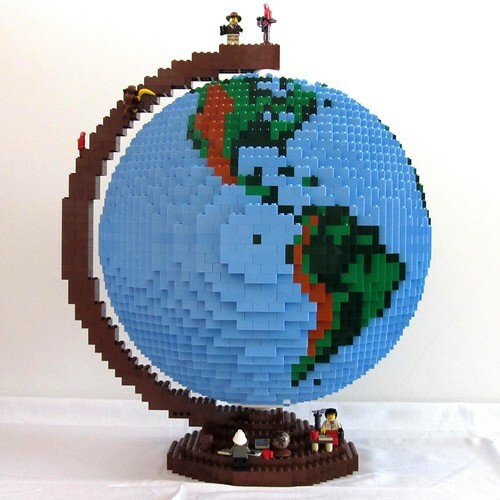 At the end of my project I decided to decorate the globe with a few LEGO elements. 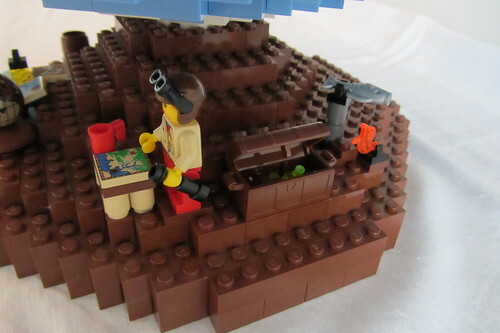 Therefore I took 3 minifigures from the adventurers series (Dr. Kilroy, Johnny Thunder and Pippin Reed), various maps, a mini globe;) and minifigure accessories. This is to remind of the numerous explorers and cartographers who explored our earth. 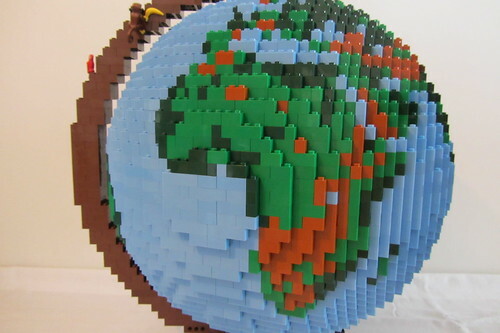 this globe is perfect for playing around! I hope you enjoyed � thanks for stopping by! Hey Dirk, just a quick note to say thank you so much for this fantastic design. I just finished my very own 'dirks globe' using your design. I could never have engineered such a fantastic model. 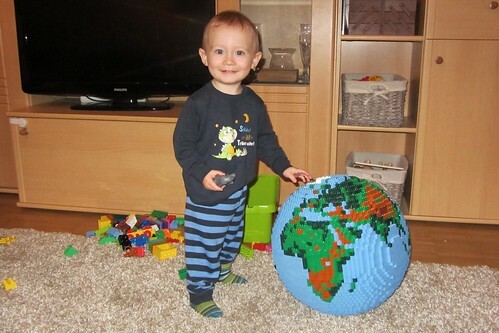 As a cartographer I'm thrilled to have been able to build my very own globe. Thanks. Dirk, thanks for making this model available. 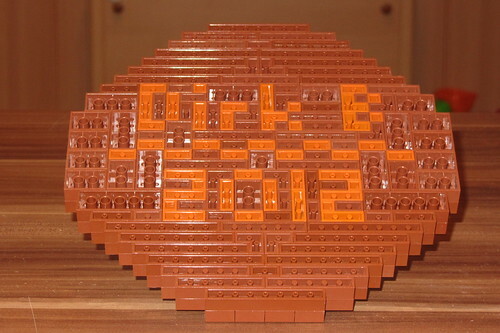 I just finished my very own dirks globe and it's fantastic! Thanks. Nice globe! Yours is my favorite one on MOC pages, and was great inspiration to me. Having recently built a globe too, I have a great appreciation for this level of detail and work involved in matching the shapes of the coast lines. I like how on your model, which has 4 distinct sides' center points, North America, Africa, Asia, and the Pacific Ocean are all pretty well centered on these 4 quadrants. But the real bonus for me was the underside view of Antarctica. Superb work! 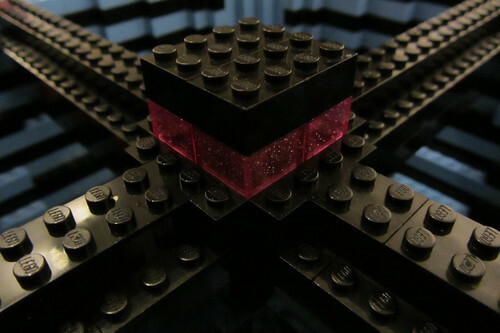 This is one of the best lego creations I have seen! Is there anywhere I can download the building instructions now? Where can I get the instructions for the build? Whenever I click on the ldd button It brings me to the building program which I already have. Not the instructions like I want. Thanks. 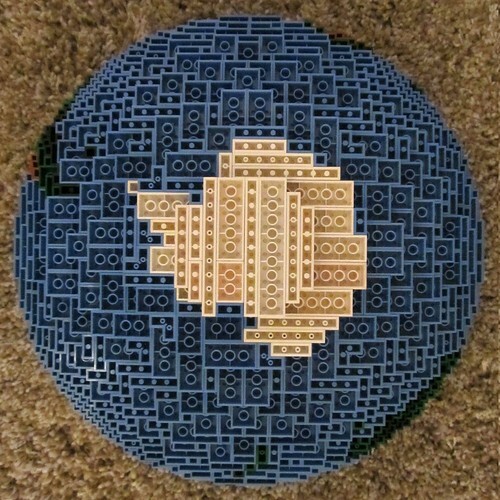 I have never seen a globe done so well. My son (soon to be 11) LOVES this and would love to build it. I tried to download your instructions but unfortunately I have a Mac and it won't open in any programs. Is there any other way to do it? Great design. I have found many designs and this is by far the most stable. I have been looking to build one, do you have a parts list for this model? great build notes here, this is so much better than those MOCs which are technically challenging and they don't give you a clue how they did it. Thanks for pulling back the veil of mystery with this one! I can really appreciate the amount of work and research that went into making this as geographically accurate as possible. Wow! This is one of those MOCs that is going to get a bookmark, and there aren't too many of those for me. I agree with Paul, the fact that it is accurate in every sense, down to small islands, is amazing. Your son looks like he enjoys it too! The accuracy of this globe is what really makes it so special. Incredible work! Not only is it functional, but it's a fantastic conversation piece! An amazing and beautiful project. Bravo! Really excellent work. I'd love to be able to download the files for this. I totally agree with Max about the color scheme! You've also done a mind-blowing job of shaping all the countries (especially taking into account that this is a sphere). A masterpiece, well done! Excellent work - and perfectly presented. 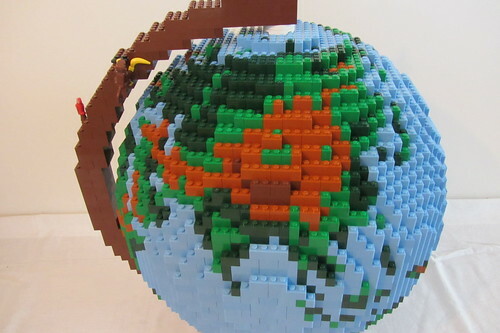 First Lego globe I've seen with such a glorious color scheme! Wow, great work. This earns a great reputation! This is fantastic. I love the tie in to The Adventurers. 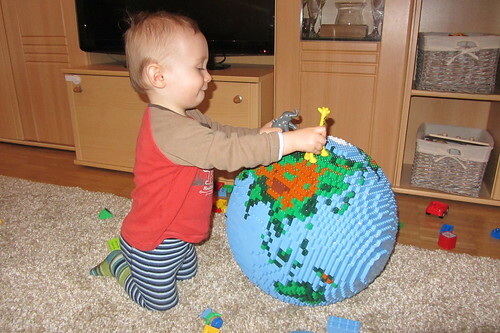 You said the size, and I thought, "Well that's not too big," and then you showed it next to your kid, and well, you know, your globe could eat him! This is astounding and totally worth every brick.